This Service is no longer Available - Page for Information Only. Without a doubt - One of the best Guitar Amps ever made was the Original Fender Princeton Reverb. If you have a Fender Princeton Reverb Reissue (PRRI) Amp, I can Handwire it for you. This takes the Amp back to it's original form, using an 'Eyelet' Main Board and BIAS Board. In Addition, all PCBs are Removed, New Alpha Pots Fitted, New Output Transformer, Multi Section Smoother Cap, Orange Drop Tone Capacitors and Metal Film Power Resistors. I also fit a couple of extra Controls - a 'Half Power Switch' which reduces the Amps Output Power to about 8 Watts -and- a 'Twin-Rectifier Switch' so that you can select 'Valve -or- Silicon' Rectifier. The Handwired PRRI Amps Sound SUPERB. Please 'Contact' me for full details. 1. - The Stock Fender 'Main' PCB, 'Pot' Holder PCB and 'Input Socket' PCB will be removed from the Amp. RAT Custom Built 'Eyelet' Main and Bias Boards will be used, which will then be fully 'Point-to-Point' Handwired into place using all New 'Alpha' 24mm Pots. All of the 'Tone' Capacitors on the RAT 'Eyelet' Board are 'Orange Drops', along with 'Metal Film' Power Resistors. 2. 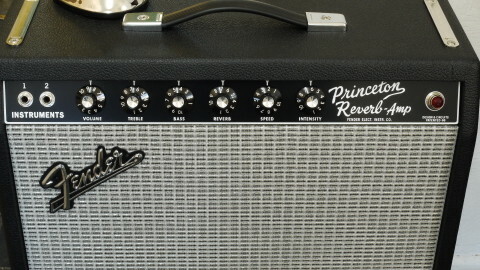 - A Princeton Reverb 'Multi-Cap' will be used, as in the Original Amp. 3. - 'Mains', 'HT' and 'Heater' Fuses will be Fitted along with a 'Safety' Resistor - so that the Amp can not hold a Lethal Charge when switched off. 4. - A RAT 'Bias Board' will be fitted (as in original Amp) with Bias Adjustment Control. 5. - 'Half-Power Switch' - This will Reduce the Output Power of the Amp to about 8 Watts RMS. 6. - Full Lead Dress - All Transformer and Heater wires in a Valve Amp must be tightly twisted or they will induce 'Noise' in the Amp Circuit. All of the wires will be Twisted and placed in the correct location - This keeps the Amp ‘Quiet’. 7. - The 'Input' Sockets will be 'Metal' Chassis mounted. 8. - 'Twin-Rectifier Switch' - This will allow you to use A 'Valve Rectifier' -or- 'Silicon Rectifier'. 9. - A NEW Matched Pair of JJ '6V6S' Power Valves will be fitted. 10. - Star Earth - The Stock Princeton Reverb Earth/Ground Paths on the PCB are a Mess and run all over the place in different directions. With the removal of the PCB this problem will be eliminated and the Correct ‘Star’ Earth (method) used. This allows all required Earth Paths to be in a logical order and kept as short as possible to eliminate any Noise ‘Loops’. There will be NO Background Noise from your New Handwired Amp. 11. - A 'Hammond 1750H' Output Transformer will replace the Stock OPT for Increased RMS Output Power. Output Power Varies slightly depending on the Power Valves used but is usually about 18~20 Watts RMS (Stock Amp is 15 Watts RMS)............ Increased Power = Increased 'Clean Headroom'. 12. - RAT User Manual detailing all of the Changes - The Amp will be 'PAT' Approved - - - (Portable Appliance Test).